Learn how to grow, plant, care and harvest tinda gourd in pots and garden bed starting from seeds. The tinda (family Cucurbitaceae, Genus Praecitrullus, Citrullus vulgaris), called Indian round gourd or apple gourd or Indian baby pumpkin or tinda gourd, is a squash-like cucurbit of genus Praecitrullus and is indigenous to India. Tinda is an annual vegetable plant popular in India, Pakistan and in other South Asian countries. 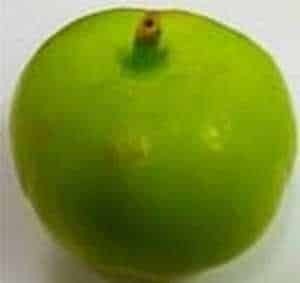 In English, tinda is called as apple gourd. It is known as tindsi, tindi, tinday, temsi, dhemase, meha in Rajasthan, Punjab, Maharastra, Nepal and different languages and places. It is similar to a summer squash and is used as curries, spicy stuffed vegetable, spicy stuffed vegetable, pickles and many gourmet dishes, even its seeds are roasted and eaten. A number of tinda curry recipes are available. The fruit is spherical ball with flat top, about 5–8 cm in diameter with light green color and about 50 gram in weight. The plant is, as with all cucurbits, a prolific vine, and is grown as an annual. Tinda gourds are fast growing vines that can grow up to about 1.5 m long. They are extremely easy to grow and produce tinda gourds two or three weeks after flowering. The seed sowing to harvest time is about 45 days. Follow the tips on how to grow tinda in pots or ground. Well draining fertile soil with a pH between 6.5 to 7.5. Add some river sand to make the soil free draining and add compost to enrich it. Tinda gourds grow best in warm, sunny conditions of tropical or sub-tropical climates, likes 25–30°C at daytime and 18°C or more during the night. Plant in the spring to early summer. You can start the seeds indoors, if you live in a colder region, and transplant the seedlings outdoors after the final frost. The soil temperature needs to be at least 25°C for the seeds to germinate. In India you can grow tinda in the dry season from February to end of April when the season is dry and also in June to end of July during rainy season . Select a Sunny location. You can plant in a large container, at least 40 cm diameter with many draining holes at its bottom. The tinda seeds should be planted in one foot (30 cm) ridges, spaced 4-6 feet (1.25-2 m) apart. Or plant seeds in rows about twelve inches (30 cm) apart. Tinda Seeds, the seeds are of dark brown color. Tinda seeds are small dark brown color. Soak the seeds overnight.Sow 2-3 seeds at a depth of about an inch (2-3 cm), keep damp. The seeds will germinate in 2-4 weeks depending on the temperature. Thin the seedlings 1-2 per hill when they have 3-4 leaves. I don't have so much space in my kitchen garden, so I plant tinda in pots. You can soak the seeds overnight before planting to speed up germination. I also put a tall trellis in the pot to train the vines to climb vertically up. This vertical growing methods saves lot of space. Keep the vines not overly dense to provide tinda gourds exposure to sunlight and air for best results. After the seedlings germinate, they can be watered only once a week. The tinda vine thrives in warm and dry conditions. The tinda vine produces flower within 3-4 weeks. The flowers are 8-10 mm in diameter. The female flower has a small round bulb at its bottom. The male and female flowers are separate which pollinate and produce smooth fruits ready to pick after 2-3 weeks. The tindas are ready to be harvested when they become round, but slightly flat with a bright green color and a distinctive flat top. Tinda plant is attacked by insects like beetles, fruit flies and white flies. seeds and plants are attractive to Birds, bees, caterpillars and butterflies can damage the leaves and fruits. Spray neem spray or garlic spray to control these problems. I usually spray neem oil and cover the fruits by polythene bags. Tinda growing in a pot. Note the good size fruits. The picture shows Punjabi tinda growing in a pot, actually a bucket. You can use any container. Cover a healthy looking large size tinda fruit with a paper or polythene bag and let it mature on the vine. When the fruit becomes over-ripe (color changing to yellowish-white), pluck the fruit. Cut the fruit and take out the seeds, wash them and put in shade completely dry them. A single tinda fruit can produce 30-50 seeds. Preserve the dried seeds in an air-tight bottle or zip-lock bag for next season.